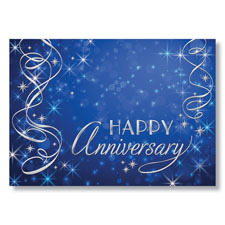 Make your team members feel valued with these attractive happy anniversary greetings. The glimmering blue field of stars looks even more like a celebration with the embossed silver metallic foil. These company anniversary cards make the occasion extra memorable. Sentiment: Thank you for being an important part of our success. Congratulations on your anniversary!